It is amazing that how sometimes when one opens up to new people, they found new friends. Once when I finally got myself out of behind this anonymous blog and joined a food event by theQguides.com, I met several fun people, including Babe, Ruth and most recently Bangsar-babe. Wow, sounds like girl-power to me, but no we have a guy, his name is Jek and most recent as well, he introduced us to his new colleague, Frat, the Marketing Head of theqguides.com. Don’t ask me who he is and where he comes from, you can find it out here, and no, the one you see at the site is not who you think it is. So one fine day, Frat asked me to go for tasting on SOULed OUT’s new refreshed menu and boy, was I excited! Our Malaysia’s homegrown SOULed OUT had always been a place which I associated with fun and happy times. This is because I had loads of memories with this place which I held dearly. I remember the first time that I ever been to SOULed OUT was years ago, with my aunty and cousins, plus my roommate, Y. Y and I had actually traveled really far, in last minute notice from my cousin, just to get there because before this, one of my cousin had actually sung praises to the Carbonara at this place as if it is the one, so with all the heart of ‘tham jiak-ness’, Y and I flew there just in time to join them and ordered the Carbonara of course! I must say our craving indeed have been answered, it was creamy and utterly satisfying! At that time we also get to enjoy a dance show, I am not sure if they still have it now, but when I said years ago, I seriously meant years ago. Then the next few times I went was actually for few of my good friends’ birthdays, many of them really memorable as SOULed OUT has always make sure that every birthday is celebrated with style, whereby the crews will come and sing a song for the birthday girl/boy, which they made to be stand out in some ways, and then after that they would take a picture for us and then print out directly with inclusion into a card for us to bring home, which I find as a really thoughtful gesture. Come to think of it, I had actually celebrated four! 1984s birthdays there as well as for a university friend. Besides that I actually went there twice for two separate companies’ team outing, oh my, so it seems SOULed OUT is the place for celebration, chilling and connecting after all! Anyway, back to the topic, what is this Refreshed Menu all about then? It is some way like this, as I understand of it, that people like me, who had been an old patron of SOULed OUT, found that some of their ol’ favourite dishes had been taken out from the menu as time goes by and as the restaurant evolves, so they had been giving feedback to have their dishes back! “We always do our best to live up to our customers’ expectations, and after 13 years the expectations get even higher. We want our customers to feel like they are family at SOULed OUT when they come here. We encourage them to be able to share their suggestions openly with us. Which is why we have decided to bring back the Good Old Favourites by popular demand of our loyal customers!” said Fred Choo, Founder of SOULed OUT. Well, without further ado, let’s proceed to the food, those favourites of many that now had been brought back for all to enjoy, which I, the lucky tham jiak girl, along with the other epicureans, get to enjoy in order to bring you our views and perspectives. The first ol’ favourite dish that was served to us was the Sizzling Lamb Cutlet, which as its named was burning with goodness, hot tender meat which was marinated in Indian herbs and spices, served with a choice of naan (Indian flat bread)/rice/chips, special spinach dip and papadum. These were actually few of those lambs that I have which was not cooked to the point of the need to exercise your jaws to exhaustion. We also had the naan and it was as usual nicely soft and chewy; SOULed OUT has always been famous for its Indian fare, and naan had always been its strength from my previous experiences. Then next on the line was another favourite brought back to the scene which is the Hokkien Mee (Chinese stir fried thick yellow noodles). When I first heard from Fanny, the propaganda pixie (yes, this is her role as stated in the card and as affirmed by her) of SOULed OUT that there would be Hokkien Mee, I raised my eyebrows in surprise and sceptism! There I was imagining Hokkien Mee best to be made in a wok over charcoal fire beside the road in a rundown Chinese restaurant, with loads of lard, pork and prawn thrown in! But let’s take this image and give it a twist, substituting with chicken slices, but still with loads of prawn, this Hokkien Mee was indeed tasty in its own way, full of the wok hei goodness. Give it a try whenever you have a hankering for some hawker fare yet still want to dine in style with your fellow companions. From the stir fry department, we also have another ol’ favourite, which was the Singapore Fried Meehoon. Though I must honestly say this was not one of the best that I have, it was quite alright though. Another noodle came up with the tag of ol’ favourites, it seemed that we Malaysians do love our noodles, and this one is the infamous Claypot Lou Shi Fun. This dish, which was the rice noodle in form of rat tailed, totally submerge in dark sauce with chickens slices and mushroom, was actually fine by its own right It may not beat some of the hawkers well known for it, but it was good enough to satisfy one’s craving for it. The family of SOULed OUT had also demanded the return of the Chicken Ala Vietnam, which was my first time trying and I found it simply delicious. The chicken was chockfull of exotic Vietnamese spices and cooked to the right juiciness. This would be one dish that I would recommend to try. One of the dishes that I do not agree with the faithful patrons was the Roast Beef Baguette, though not too bad, I did not find it anything spectacular. The chips though was crunchily addictive, which I happily helped myself to finish it. Besides having the chance to taste all their comebacks dishes, we were also introduced with their spanking new ones. One of them is Koay Teow Beef Tausi, which was flat rice noodles cooked in tausi (fermented black beans) gravy with beef slices. It was a unique dish, which I find quite palatable, worth a try if you have the chance. The second new dish was Pan Seared Grouper, which was grilled grouper fish fillet with Cajun spice, served over pasta, which I find a bit bland, not one that I thoroughly enjoy, as compared to the rest. One more new dish that I had the pleasure to try was the new BBQ Chicken pizza! I have always loved the pizza at SOULed OUT, when it was first introduced and I tried it, I fell in love instantly as it was totally authentic with wood fire oven and the crust was how I always imagine it should be, thin, chewy yet crunchy at the right places. This new toppings was enjoyable, especially if you love BBQ sauce. But this new pizza definitely could not beat the all time favourite Sake San pizza (salmon slivers, roe, cherry tomatoes, lolorosso with Japanese mayo and wasabi), which had coincidently been my all time favourite as well, where I had ordered in numerous occasions. Totally messy and finger-licking good, we even joked that it should be one dish you not have on your first date, but definitely one you should have many dates after that! 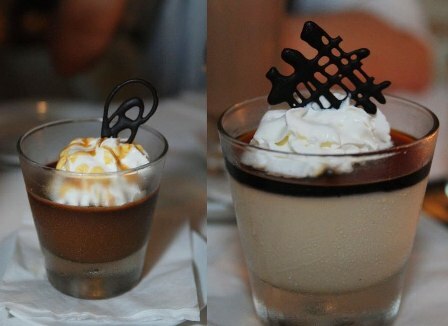 Then finally, we end the night with a sweet note, with the Praline Chocolate Mousse, Lava Cake and Pannacotta. I totally fell for the Lava Cake (too bad no picture though), which was an all time favourite, which would be one of mine now, warm gooey chocolate cake with the creamy vanilla ice cream, it was heavenly. One bite into it and I told Ruth that I shall not be returning it with an evil smile, but of course I did, good things are meant to be shared! As for the praline, it was new to the menu, albeit over-chilled, it was certainly spoon-licking good! That’s it for the refreshed menu; I had sincerely thoroughly enjoyed some of the dishes, so it seems that the loyal patrons do know what they are demanding for! Whether you are the family of SOULed OUT or you have yet to be, you should head there now to satisfy your cravings for the former or to pique your taste buds for the latter, they would certainly welcome you to the family if you want to be in. Desa Sri Hartamas, 50480 KL. Here's hoping we meet up one day too! kenny, hope to meet you one day too! Glad you and the rest enjoyed yourselves... very rewarding to work with individuals who are easy going and know how to have a good time. Let's catch up again ya? I surely will try Sake San Pizza.